Today was the kids' second full day of preschool, so I decided to venture out to Ikea. We don't have our car yet, and Steve will have it at work anyway, so I figured I should learn how to get there using public transportation. First I headed west on Tram 3 to take the kids to school. Fortunately today it wasn't as crowded as on Tuesday when we were packed in like sardines with standing room only. The preschool is small and has only two classes; Bowen is in class with babies who are very sad to be left by their mummies, so Bowen in turn is very sad for me to leave. So I let him sit in my lap during circle time, then I sneak out when it's time to play. They have a train set, he is fine. In a few minutes I boarded Bus 311 to Bäckebol, and in about 15 minutes it stopped right in front of Ikea. Much easier than the trip I anticipated to the southern Ikea. My first impression of Ikea in Sweden is that it is exactly the same as Ikea in the States, except for all the signs being in Swedish. In the States only the product names are Swedish (often named after places in Sweden), but the signs for everything are in Swedish here. That chocolate thing back there was awesome. Another difference is Swedish Ikea has a bigger dessert selection at the cafe, and when you finish your meatballs or shrimp sandwich you sort out any recyclables and put the tray on a conveyor belt. The order of the showroom upstairs is a little different (kids are in the middle) and at the post-checkout cafe they have Swedish style hot dogs (12" dog on a 6" bun) and kanelbullar cinnamon rolls (smaller, denser, heavy on the cardamom). But everything else is pretty much the same, even the "Swedish food shop" at the exit. Ikea felt familiar, like home, probably because my mom has been taking me to Ikea as long as I can remember. It's ironic that we put all of our Ikea stuff in storage to move to Sweden, only to get here and find Ikea furnishings in our apartment. We have the exact same pair of these yellow-handled scissors at home. We gave away a lot of our toys back in the States because we weren't shipping a container over here, so the kids have been playing with the few things we stuffed into suitcases. 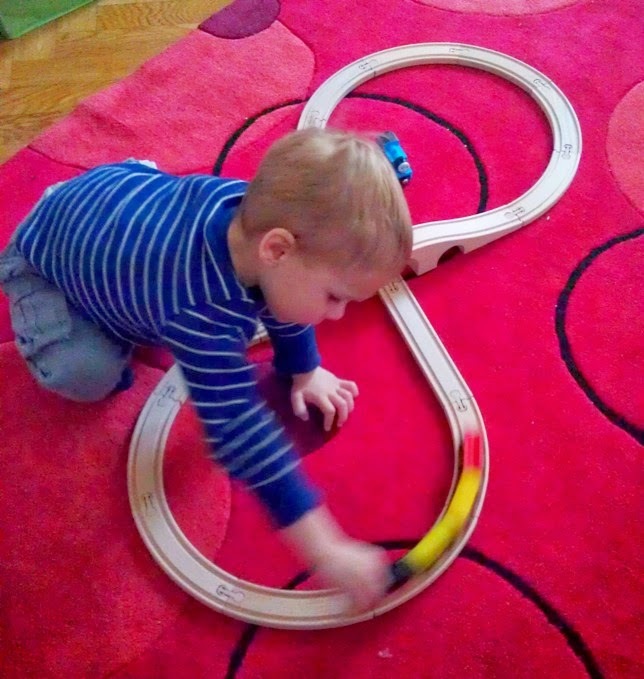 But now Bowen, our train-obsessed little man, has a train set again. And Thomas fits on the track, but not under the tunnel, so he is mainly involved with "helping" the new train over the bridge, or playing super hero when somebody (usually the Woody figurine) gets run over. He may be really sweet and huggy, but he's still a boy. So anyway, I made it back to drop off stuff at the apartment before heading out to pick up the kids. It's Thursday, and the traditional Thursday night dinner in Sweden is pea soup and pancakes, so we had pancakes for dinner. Fluffy American-style pancakes and not the flat crepe-like Swedish pancakes (although I love them, too). Served with lingonberry sauce, which makes twice in one day for me. (It's hiding behind my meatballs in the photo above.) And because we're out of meat again and we got another package notification, after dinner we walked to the "post office" grocery store to pick up our box of books that arrived. We used an M-bag from the USPS; that was the least expensive way we found to send something so heavy. I'm pretty sure delivering M-bags is what Santa does in the off-season. I would love to explore the Quintessential Swede concept once I get my spycam technique perfected. Ok, I really wish I was there to roam IKEA with you! Sounds like a great day for you with much accomplished. For the record, please hurry with the spycam, can't wait for the blog posts then!